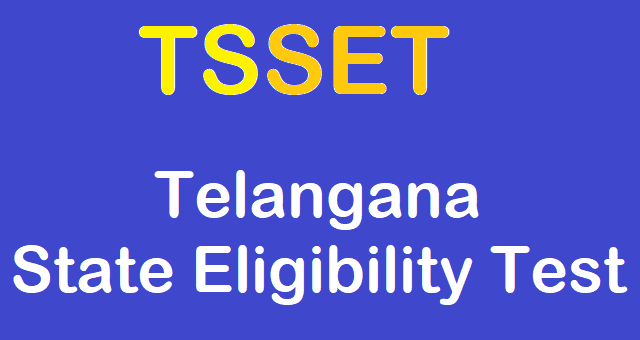 TSSET 2018,Telangana State Eligibility Test 2018 Notification had been issued by the Osmania University for recruitment as Assistant Professors / Lecturers in various University / Degree Colleges / Institutions of Higher Education in Telangana.Telangana State Eligibility Test (TSSET-2018) for the Year 2018 to be conducted by OU for recruitment and promotions of Lectures/Assistant Professors in Degree Colleges as per the University Grant Commission Regulations for the year 2018. The University invites the online applications from eligible candidates to appear for The Telangana State Eligibility Test 2018. No upper age limit for TSSET 2018. A candidate can avail any number of chances. So, State Eligibility Test for Telangana State -2018 (SET-TS) will be conducted by the Osmania University. SET- TS informs that the SET will be conducted in 27 subjects as per the schedule. The candidates should have a Masters Degree from a University Grants Commission recognized university with minimum 55 per cent marks for General candidates and 50 percent marks for BC/ SC / ST / PH / VH. Candidates who are appearing in the final year of their Post Graduate examination may also appear in this examination. b. Candidates who have secured at least 55% marks (without rounding off) in Master’s Degree OR equivalent examination from universities/institutions recognized by UGC are eligible for SET. The Backward Classes (BC) / Scheduled Castes (SC) / Scheduled Tribes (ST) / Physically Challenged (PH/VH) category candidates who have secured at least 50% marks (without rounding off) in Master’s degree or equivalent examination are eligible to appear the SET. c. Candidates who have appeared (OR) will be appearing at the qualifying Master’s Degree examination and whose result is still awaited (or) candidates whose examinations have been delayed may also apply for this test. However, such candidates will be admitted provisionally and shall be considered eligible for award of Lectureship eligibility only after they have passed their Master’s Degree examination (or) equivalent with at least 55% marks (50% in case of BC/SC/ST/PH/VH candidates). Such candidates must obtain their P.G degree mark sheet within one year from the date of SET with the required percentage of marks, failing which they will be treated as disqualified. his/her candidature. Candidates may note that their candidature will be deemed final upon verification of eligibility conditions. AGE LIMIT: There is No Upper age limit to apply for TS-SET examination. The Telangana State Eligibility Test 2018 will be conducted in objective mode. The TS SET test will consist of 2 papers. All the two papers will consist of multiple choice questions and will be held on the day of examination in two separate sessions. TSSET-2018 Applications should be submitted through online mode only. The Registration fee for online submission and late fee, if applicable may be paid through payment gateway(Credit card/ Debit card/ Net Banking). #Physically Handicapped Certificate (for PWD Candidates). #A set of all above certificate photostat copies.